When the Sara’s father, Joseph, welcomed David Keeler into the family business, he never dreamed he was getting a son-in-law as well as a new employee. At the time, Sara was also working at Bedford Gravel and Landscape Supply. There was an instant attraction between Sara and Dave. Their first date led to a second, then a third, and eventually to an engagement during a Disney World vacation. 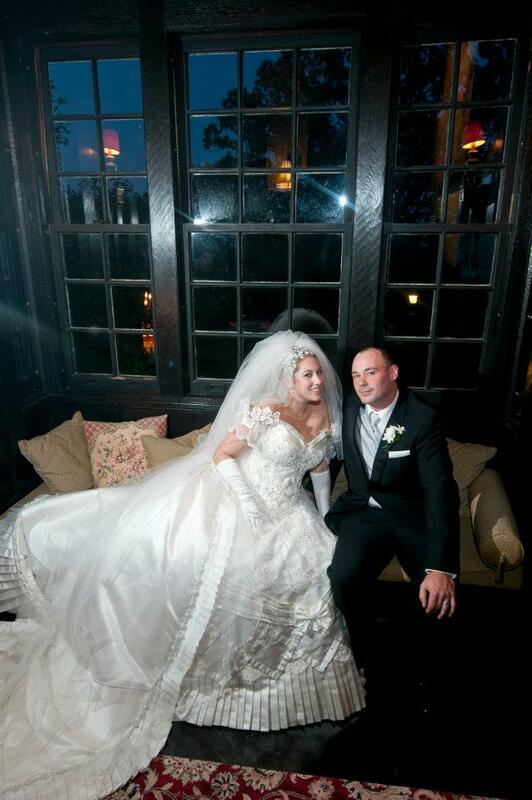 Sara had always dreamed of an autumn wedding at the Castle on the Hudson in Tarrytown, NY. Incredibly beautiful and romantic, this masterpiece of old world craftsmanship overlooking the Hudson River is a perfect recreation of a medieval castle. Its 40-foot vaulted ceiling, Tiffany-styled stained-glass windows, and musician’s balcony more than fulfilled Sara’s princess fantasy. 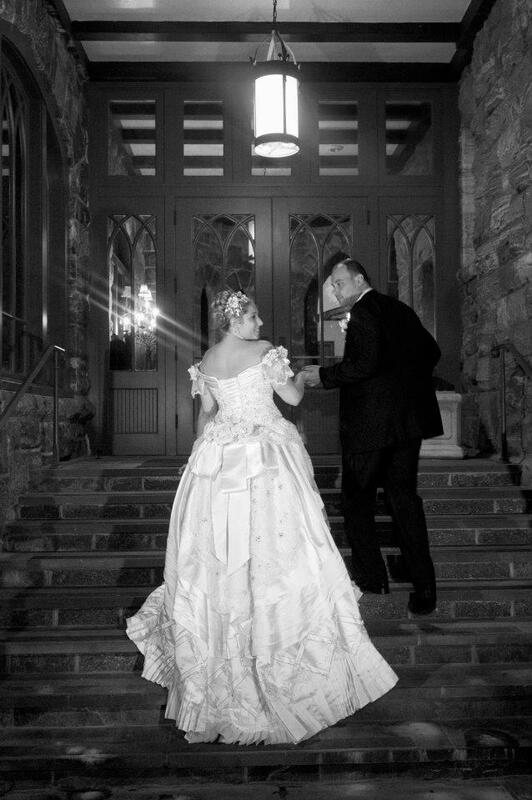 As luck would have it, the Castle was available on October 9, 2011, so Sara and her family immediately set wedding plans in motion. Their first mission was to find a wedding gown suited for such magical surroundings. Sara had a unique style in mind. She longed for something reminiscent of the extravagant Victorian designs of the famous couturier, Frederick Worth (1826-1895). With the production of her gown well underway, Sara began to search for the headpiece that complemented her, coordinated with her gown, and satisfied her fashion fantasies. She had always loved roses and planned to incorporate the fragrant, romantic blooms into her centerpieces, bouquets, cake, and dress. Imagine Sara’s excitement when she discovered the crystal-encrusted rose headpieces created by Bridal Styles Boutique in Brooklyn, NY. 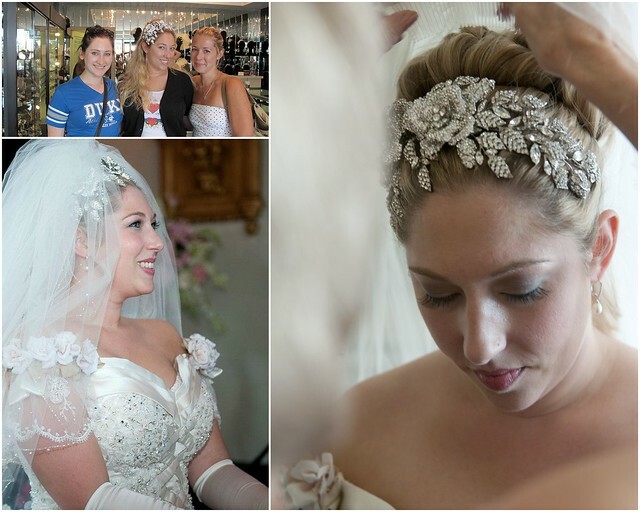 Surrounded by the exquisite headpieces and shimmering accessories in this special salon, Sara and her mom were in heaven. After expressing her desire for a Bridal Styles rose tiara, Edward, one of the owners, chose one that was featured on their website. Though beautiful, they all agreed that it wasn’t quite perfect. After a moment’s thought, Edward said he had one in the workshop that would fulfill her dreams. What he presented was a work of art. Crafted from thousands of tiny Swarovski crystals and larger marquise stones, the extravagant piece framed Sara’s face with three-dimensional roses, rosebuds and leaves. 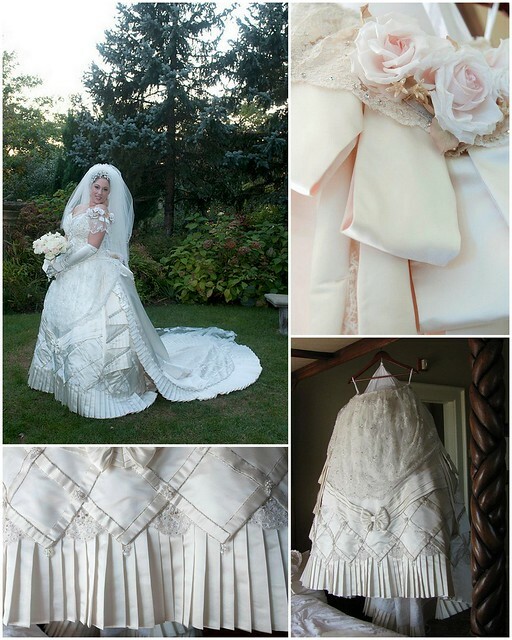 On her wedding day, Sara knew everyone would be eager for a glimpse of the extraordinary gown her mother had made. Both she and her mom wanted to wow their guests and the groom as the doors opened for her walk down the aisle. So, knowing she had only one day to look and feel like a princess, Sara embraced it. When she appeared on her father’s arm, the collective gasp told Sara and her mom that their creation had surpassed everyone’s expectations. 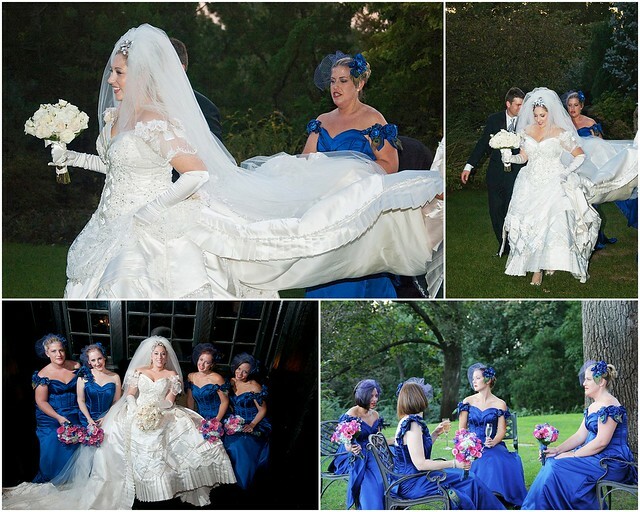 Unlike many brides who opt for comfort, Sara went for all-out glamour. 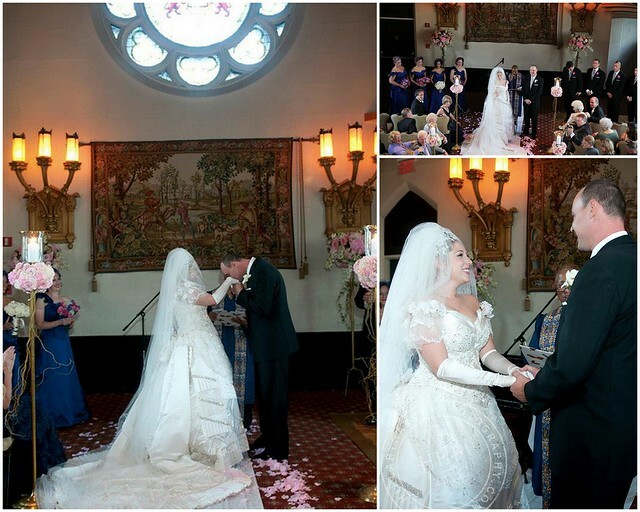 During the ceremony and cocktail hour, she wore her gown’s long, detachable train, her headpiece and a three-tiered cathedral-length veil. 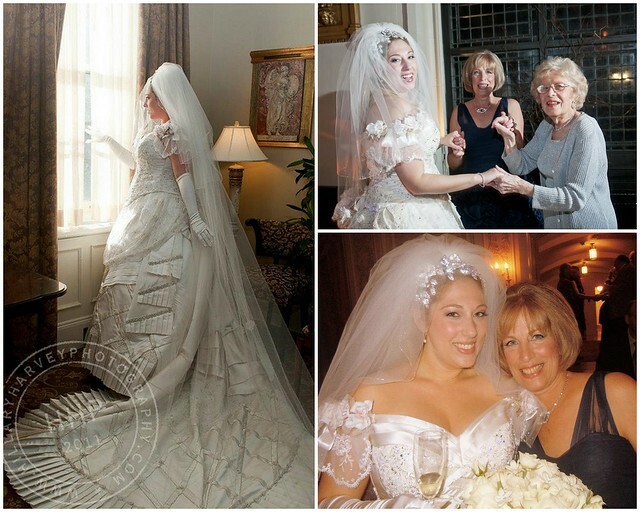 Then, for the reception, Sara removed the long train and veil to reveal her gown’s spectacular skirt. Near the end of the reception, Sara removed her remaining shorter veils to showcase her stunning headpiece. After the wedding, hoping a beloved granddaughter would someday wear it, Nancy carefully packed the dress away. Much too exquisite to be hidden away, Sara is having her headpiece mounted in a shadowbox as a beautiful reminder of her wonderful day. Best wishes, Sara and David, and thank you for sharing your wedding story with us! This entry was posted on Tuesday, March 6th, 2012 at 9:05 am	and is filed under A Wedding Story. You can follow any responses to this entry through the RSS 2.0 feed. You can skip to the end and leave a response. Pinging is currently not allowed.